I’m a Summer baby so naturally the summer has my heart— but the Fall, the Fall is a close runner up for my love. Unfourtunately, I have lived and currently live in locations that won’t allow my Fall “fashions” to prosper. But when has 75 degree weather ever stopped me from being great? Never! Fall is so much fun in regards to fashion. You can wear things that make no damn sense in the Fall, like shorts and knee high boots or a fur with any and everything. The part I enjoy the most about Fall, is pairing my outfits with super cute coats. A peacoat can literally turn up or make any outfit. Especially if it’s plaid! Bazar, Elle, and InStyle all dubbed the plaid trend the go to trend of the Fall. See how I’m starting my Fall fashions off below featuring a trend debut by plaid. 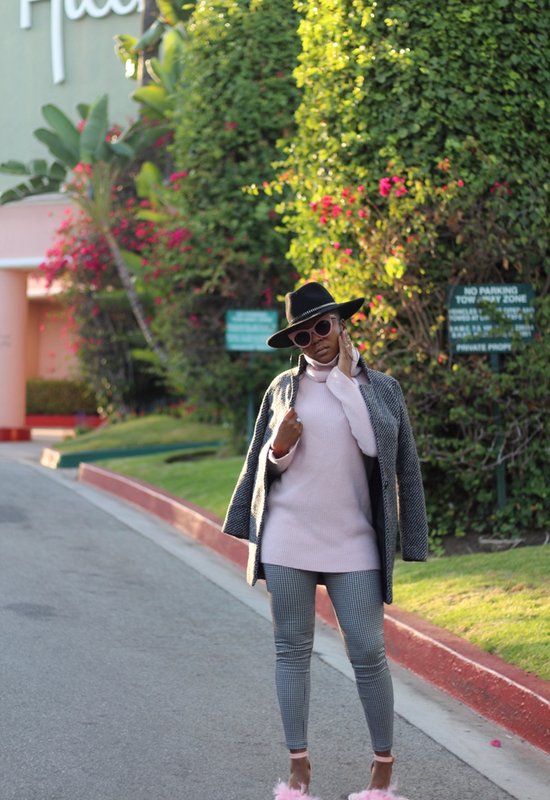 I burned up but killed it in a cashmere thrifted sweater, high waist plaid pants, DIY feather heels, a brim, and of course a plaid peacoat!